The 2015 Mazda6 is a sleek sedan for getting you around in style and comfort while still practical. At Cutter Mazda in Waipahu, HI we have a large inventory of the 2015 Mazda6 and are motivated to sell. Cutter Mazda Waipahu serves Wahiawa, Kapolei, and Pearl City, HI areas, you are family. Let’s see how the Mazda6 compares to the Hyundai Sonata. The 2015 Mazda6 is equipped with a 2.5-liter inline-four engine with a front-wheel drivetrain and the 2015 Hyundai Sonata is configured with a 2.4-liter inline-four with the same drivetrain, but their capabilities differ. The 2015 Mazda6 makes 185 lb-ft. compared to the Sonata’s 178 lb-ft. of torque, meaning that the Mazda6 can pass slow-moving traffic with ease and also earns better mpg than the Sonata. 2015 Mazda6 models equipped with the optional automatic transmission make 26 city and 38 highway mpg, compared to 25 city and 37 highway mpg Hyundai Sonata. This might not sound like much, but it starts to add up considering the average monthly fuel cost for the Mazda6 is $146, whiel the Sonata’s is $151. It may be $5 a month, but that becomes $300 a year. The interior of the 2015 Mazda6 is made to mimic its sporty exterior and sporty driving dynamic. Designed for optimum driver-seat ergonmics, the Mazda6 offers easy access to all vehicle controls and also includes steering wheel-mounted supplemental controls for easy operation while driving. 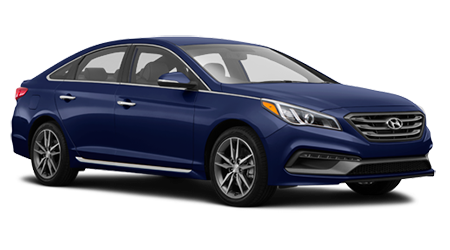 The 2015 Hyundai Sonata is similarly appointed, but looks chunky and is not as elegantly or ergonomically designed. For passengers in the front seat, the Mazda6 offers 56.1 inches of hip room, while the Sonata only offers 55.3 inches for hips up front. In the rear seats, the Mazda6 has 38.7 inches of legroom, which beats the Sonata by more than 3 inches. Mazda is a proven brand with a rich heritage in building reliable and fun-to-drive vehicles. Mazda has been in business since 1920 and exporting vehicles to the US since the 1960’s. They have made an assortment of vehicles that have helped establish the name, including one of the most respected sports cars ever created; the RX-7. They have also been an established name in motorsports, utilizing proven performance to shape and create technologies for their line of vehicles. Hyundai by comparison has only been around since 1990 and is still trying to establish a strong name.